Close up of tower of the Nauvoo Temple with clock and weather vane. 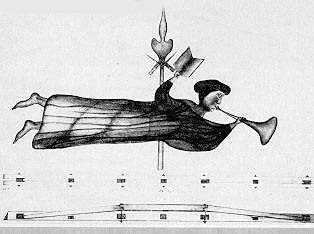 William Weeks' drawing of the weather vane as an angel for top of tower. on this Day they raised the Feigr [Figure] wihich [which] is the reprisentation [representation] of an Angel in his Priestly robe with the book of Mormon in one hand and a trumpet in the other which is over laid with gold leaf (Perrigrine Sessions Journal, circa 4-5, Feb. 1846, LDS archives). LDS History of the Church 7:577 under the date of 30 Jan. 1846 mentions that the "vane was put upon the tower of the Temple." The following genealogical information contains extracts of data from the Nauvoo Temple records of the Church of Jesus Christ of Latter-day Saints. Individual names and dates come from the washing and anointing records; endowment records kept by the temple recorder, William Clayton; washing and anointing records kept by the First Quorum of Seventy and miscellaneous lists for the period of 10 December 1845 to 8 February 1846. 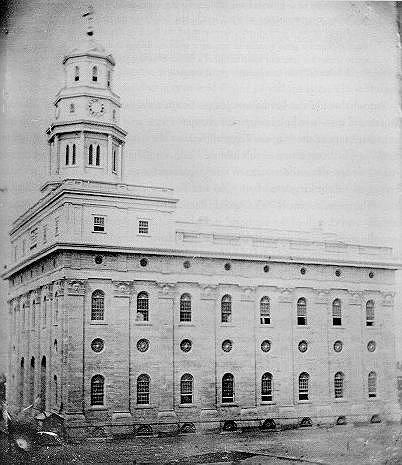 The Heber C. Kimball Journal (21 November 1845 to 7 January 1846), includes the official record for ordinances in the Nauvoo Temple kept by William Clayton, temple recorder, for the period 10 December 1845 to 7 January 1846.